The use of asbestos was widespread in Australia. It was mined in NSW from 1940 – 1979 at Baryulgil on the north coast, and at Barraba (Woodsreef) in the New England tablelands from 1918 – 1983, in WA’s Yampire Gorge, in the early 1930s to 1943, and in Wittenoom Gorge, from 1943 to 1966. It was also imported into Australia from overseas, mainly from South Africa. In post World War 2 Australia, nearly every home, building and piece of equipment used in everyday life, may have contained asbestos. Asbestos was manufactured into a variety of building products, asbestos cement flat sheet, asbestos cement corrugated roof sheeting [also commonly used for fencing], asbestos containing; carpet underlay, floor wall and roof tiles, floor linoleum, gaskets in stoves, wood and gas heaters; insulation in hot water boilers; roof insulation; lagging insulation around water and gas pipework and around boilers and hot water services; heater and stove flues; waterproof panelling under floor tiles/linoleum and behind wall tiles in wet areas; kitchens, bathroom, laundries and toilets, the list is almost endless! In the kitchen, asbestos containing ‘oven mitts’ and ‘asbestos’ potholders were the norm! But it wasn’t just used in the building industry. Asbestos was used extensively in the industrial, commercial, manufacturing and automotive industries. There are thousands of kilometers of asbestos containing drinking water, irrigation and sewerage pipes, and over a million asbestos containing telecommunication pits spread throughout Australia. In the automotive industry, asbestos containing brakes, gaskets, insulation’s and sealants were part of almost every car, truck, bus, train, ship and airplane. Many commercial buildings contain air-conditioning plant and systems that contain asbestos; inside duct-work, in boilers or on the outside of pipe work as insulation. You name it, virtually every facet of home life, and life in general in the 20th Century, would have involved asbestos. Unfortunately, people living in the 21st century will exist with the negative consequences of this ill – advised insatiable use of asbestos for many decades to come. 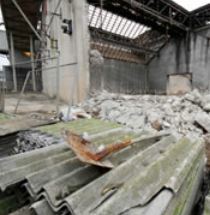 Asbestos was used in building materials in Australia up until the late 1980s, but its’ use and importation was not totally banned in Australia until the 1st January 2004. People have been, and continue to be, exposed to asbestos fibres, not only in their homes, and recreation pursuits, but also in their everyday work life!